Leonhard Euler was one of the greatest mathematicians in history: not only did he produce outstanding mathematics, he produced it at an outrageous rate, publishing more than any other single mathematician before or after him. If quality of output multiplied by quantity of output is equal to greatness, then Euler is the greatest mathematician ever. His work encompassed all of mathematics, nearly all of physics, and a significant part of astronomy. An astonishing fraction of the total research in mathematics and the physical sciences carried out between 1730 and 1780 was solely Euler’s work. Although he went completely blind at age 64, his remarkable mathematical flow continued without interruption – in fact, it increased. 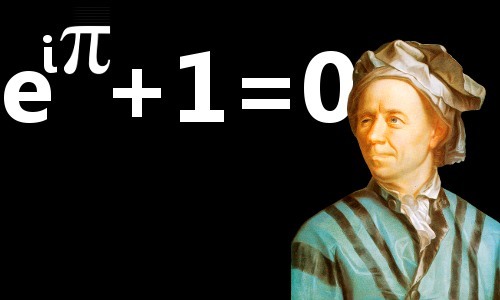 Leonhard Euler (pronounced “oiler”) was born on April 15, 1707 in the city of Basel, Switzerland. His mother was Marguerite Brucker and his father was Paul Euler. Leonhard was the eldest of their four children. Leonhard’s mother was a pastor’s daughter. His father was a pastor in a Calvinist church. Leonhard’s father had studied some mathematics at university while taking his theology degree, and was a friend of the Bernoulli family, famed for their mathematical prowess. Leonhard grew up in the town of Riehen, about 5 miles (7 km) from Basel, very close to Switzerland’s borders with both France and Germany. His school in Riehen was not especially good, so his father gave him extra mathematics lessons – Leonhard was interested enough in the subject to get his own mathematics books to work through. Like Carl Friedrich Gauss, born 70 years after him, Leonhard showed unusual talents in mental arithmetic, performing difficult calculations in his head. He also had a phenomenal memory: when prompted, he could readily recite long poems, and his knowledge of facts, and scientific and mathematical data was encyclopedic. At age 13, in 1720, Leonhard enrolled at the University of Basel, graduating three years later as a Master of Philosophy. His thesis analyzed the philosophical works of two mathematical geniuses, Isaac Newton and René Descartes. His father hoped Leonhard would follow in his footsteps to become a Calvinist pastor, but private lessons with Johann Bernoulli revealed Leonhard was blessed with astonishing mathematical talents. Bernoulli was probably the world’s greatest practicing mathematician at the time. He was also a good friend of Leonhard’s father, and the two discussed Leonhard’s remarkable aptitude for mathematics. The result was that Leonhard was allowed to spend three further years studying mathematics under Bernoulli’s guidance. So Leonhard followed a mathematical rather than a spiritual calling. Nevertheless, he remained devoutly religious throughout his life. Leonhard Euler tried hard for a professorship at the University of Basel, but was unsuccessful. On May 17, 1727, he arrived in Russia’s capital city Saint Petersburg, where his friend Daniel Bernoulli was employed as a mathematician at the Imperial Russian Academy of Sciences. Daniel’s brother Nicolaus had died of fever in Russia the previous year, and Daniel was homesick, wishing he had Swiss colleagues. Johann Bernoulli, Daniel’s father, sent Euler to Saint Petersburg bearing gifts – tea, coffee, and brandy that Daniel had been longing for. With an unusual talent for learning languages, Euler quickly mastered Russian. Beginning work as a physiology researcher, he was soon working in the more appropriate field of physics, becoming a professor of physics in 1730. In 1733, Bernoulli returned to Switzerland. Euler, now age 26, replaced him as senior chair of mathematics. Soon Euler also became head of Geography. Geography might have been at least partly responsible for Euler’s eyesight problems, which began when he was 31. He strained his eyes badly working on mapping Russia, and in 1740 he lost his right eye. In Saint Petersburg, Euler became great friends with Christian Goldbach, famous for the still unproven Goldbach Conjecture, which says that every even number greater than 2 can be expressed as the sum of two prime numbers. It’s clear, therefore, that any brief summary such as this one can present only a few drops from the great ocean of Euler’s achievements. Each successive term in the series is smaller than its predecessor and mathematicians already knew the sum would converge to a particular value, but nobody had been able to find that value exactly. This discovery made Euler a star in the mathematical world. Euler took his next step to superstardom in 1737, when he published Mechanica, a great leap forward in the mathematics of movement, made possible by Euler’s own innovations in mathematical analysis. Euler would have described analysis as the mathematics of the infinite and the infinitesimal. Today we could describe analysis roughly and somewhat incompletely as sophisticated calculus dealing with limits and continuity. In Mechanica Euler utilized analysis to express the discoveries Isaac Newton had presented 50 years earlier in Principia in a more mathematically refined and useful way. After Mechanica, Euler continued to work on the laws of motion. Whereas Newton’s laws applied to point-sized particles, Euler’s derived new laws that could be applied to rigid bodies with real dimensions, devised the principles of linear momentum and angular momentum, and derived the familiar differential equations of motion for rigid bodies, which today are described as Newtonian equations. In 1748, Euler released the book Introductio in analysin infinitorum, which, like most of his output, he wrote in simple and elegant Latin. Its title in English is Introduction to the Analysis of the Infinite. It is probably the greatest modern textbook in all of mathematics. It deals in great detail with analysis, studying mathematical functions through infinite processes, particularly infinite series, which were something of a specialty of Euler’s. Euler made a great number of other contributions to calculus, the mathematics that reigns supreme in the physical sciences, reaching a pinnacle with Institutiones calculi differentialis, or Foundations of Differential Calculus, published in 1755, presenting among other things differential calculus of functions. Euler’s book was the basis of all future work in the field. Euler introduced or popularized many of the mathematical terms we are familiar with today. The Euler Identity arose as a specific example of Euler’s success in defining the exponential function for complex numbers and his discovery of its relationship with the trigonometric functions. For example, a cube has 6 vertices, 12 edges and 8 vertices. Of course, when you put these numbers into Euler’s formula, you get the expected answer of 2. Euler’s formula works not just for cubes, but for all convex polyhedrons. Euler did not write only for the intellectual elite. His two-volume work Letters to a German Princess, On Different Subjects in Physics and Philosophy was one of the first popular science books. Published in 1768 and 1774, it was read throughout Europe and North America. The book was a compilation of more than 200 letters Euler sent between 1760-1762 to Friederike Charlotte, when he tutored her on behalf of her uncle, Frederick the Great. Is air held by gravity? Why does it get cold on high mountains? In January 1734, after becoming senior professor of mathematics at the Russian Academy of Sciences, Euler married Katharina Gsell, whose father was a Swiss artist working at the Academy. Only five of their thirteen children survived their infant years. Euler loved spending time with his children, and found some of his best ideas came to him while cradling a baby in his arms. Every evening he would spend time with his family reading and discussing the Bible. After 14 years in Saint Petersburg, Euler grew worried about the growing political turmoil in Russia and the sheer number of people being executed. It seemed to him that anyone in Russia who said anything could be hanged for it. He was glad to accept a generous offer from Frederick the Great of Prussia to move to his capital city, Berlin, to work in its Academy of Sciences. In 1741, Euler began the first of what would be 25 years in Berlin. Although Euler was undoubtedly a mathematical superstar, his quiet, unassuming demeanor began to annoy Frederick, who expected people at his Academy to engage in witty, sparkling intellectual conversations. In contrast, even though Euler had abandoned Saint Petersburg, the Russians treated him with the greatest respect. They continued to communicate with him and pay him a salary. Euler used the salary to buy books for the Russian Academy. In 1760, the Russian army invaded Prussia and entered Berlin. Russian soldiers pillaged Euler’s country estate, where his mother, wife, sister-in-law, and his children lived. When he learned of this, the Russian commander personally paid Euler for the damage. Later, Empress Elizabeth of Russia sent Euler a very large sum of money as further compensation for the trouble he had been put to. In 1766, the Saint Petersburg Academy invited Euler to return, offering him an enormous salary and offering his sons jobs too. The political situation in Russia was now secure, so age 59, Euler gladly left Berlin and returned to Russia. Sadly, his second and final spell there was difficult. Euler’s mathematical output actually increased! However, to add to his woes in 1771, his home burned to the ground, and the blind Euler was saved by a servant carrying him to safety. Euler’s wife Katharina died in late 1773. In 1776, Euler married Katharina’s sister-in-law Salome Abigail Gsell. Leonhard Euler died, age 76, from a brain hemorrhage on September 18, 1783 in Saint Petersburg, Russia. He was buried beside Katharina at the Smolensk Lutheran Cemetery on Dekabristov Island, close to Saint Petersburg. He continued working productively to the end. He was survived by Salome and three sons from his marriage to Katharina. His eldest son Johann became an illustrious astronomer and mathematician, his second son Karl became a renowned physician, and his third son Christoph became a military officer and amateur astronomer. "Leonhard Euler." Famous Scientists. famousscientists.org. 20 Jan. 2017. Web. Image of Clifford Truesdell is licensed under the Creative Commons Attribution-Share Alike 2.0 Germany license by Mathematisches Forschungsinstitut Oberwolfach.